owe you a debt Zeus himself cannot forgive. A debt is owed to the bull. A debt is owed to all the bulls. A debt is owed to the cattle. A debt is owed to all of the animals. A debt is owed to all that lives. Even as this vigil unfolds for me, violence explodes in Pamplona and well beyond. 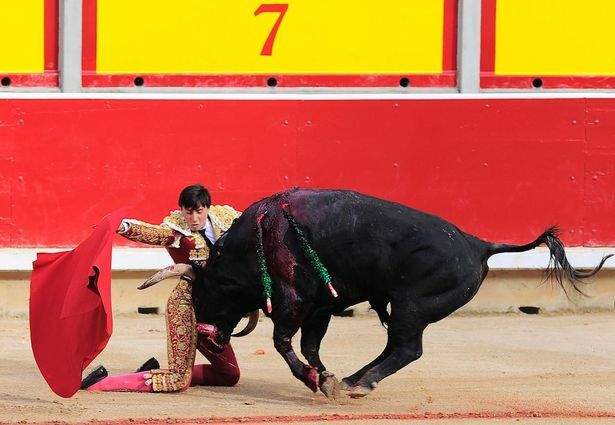 People getting injured in the running and the subsequent bullfights there, and one man dying during another bull run, are but the first circle. In my own country, there has been a resurgence of reports of black men being killed by police, followed by a retaliatory attack that left fiver officers dead and seven others injured. American troops will not be pulling out of Afghanistan this year, extending the country’s longest-ever war; meanwhile the war in Syria continues to lead to refugees, bombed hospitals, and terrorist attacks throughout Eurasia. We owe a debt to those who die. We owe them the assurance that their deaths are not without purpose. We owe them a guarantee that those who kill will answer for their deeds. We owe them a system to prevent unwelcome death, honor necessary death, and remember all the dead. No bull should die in fear to test the mettle of a matador. No black man should die by a bullet because a police officer’s fear overcame training. No officer should die because distant colleagues act from fear or hate. No observant Muslim should die simply because he offered to break fast with a stranger. No death should ever be brought lightly, and without respect for the fundamental sacredness embodied by all life.